We have so much wonderful new content for you this month! But first, if you haven’t gotten The Lifegiving Parent yet, might we encourage you to go order a copy? Or ask your library to order a copy? Gretchen and I have had the privilege of reading advanced copies and this book is amazing. It sums up so much of what Sally has been communicating to us through her books and podcasts over the years, with the added benefit of having Clay’s voice and perspective on the topics. Today, May 1, is launch day and so there are many fun things happening around cyber space. If you haven’t yet, go check Sally’s Instagram feed and watch for giveaways there because we have one almost every day this week. Due to Sally’s severe eye injury, Gretchen and I (along with our friend, Misty) have had the privilege and responsibility of stepping up and doing much of the “screen” work for this launch. It has been great fun to interact with so many people that are excited about this new book. Also, if you haven’t listened to Sally’s podcast series on parenting this week, go and do that when you have a moment. They are short podcasts with a whole variety of interesting and seasoned parents, each parenting in different ways, but all with the heart beats of Lifegiving Parenting- giving your child the life of Christ. Gretchen and I have been personally encouraged in our own parenting as we’ve listened. In honor of the launch of The Lifegiving Parent, Clay has written a special 7-day devotional for parents. Sally and Clay gifted this to the launch team and decided that they wanted you to have this as well. So- totally unplanned and last minute, we added that to this month’s new content. LEGACY: This month, we have added two Legacy talks for you. These are from a series that Sally did called Keeping Peace at Home. The first is Giving Peace Through Discipleship and the second is Centering on the Peace of God at Home. We know you'll be blessed and inspired to apply scripture to your life at home. This month, Storyformed continues the wonderful author series with a podcast about James Herriot. He was an animal vet in rural England and wrote down fascinating stories about his true experiences. This podcast is another gem from the women at Storyformed. These are intended for you to be able to listen with your children as well, so grab a cuppa and a little snack and turn it on! In our new Hebrews study, Sally talks about one of her favorite heroes, Daniel: A Man of Prayer. You will be challenged and strengthened in your own walk as you listen and ponder his story. Brandee has done another video tutorial with a delicious and beautiful recipe for Italian Flank Steak. It is a layered and wrapped steak that comes out looking like it’s from a fancy restaurant. I encourage you to try it. Watch Brandee’s video before you begin because she includes several helpful tips. Please continue to pray for Brandee’s daughter Marissa who was in a terrible car crash just before Easter. She is home now (Praise GOD! ), but recovery is very slow and includes regular setbacks. Thank you for lifting her up to our great God who delights to hear our prayers. 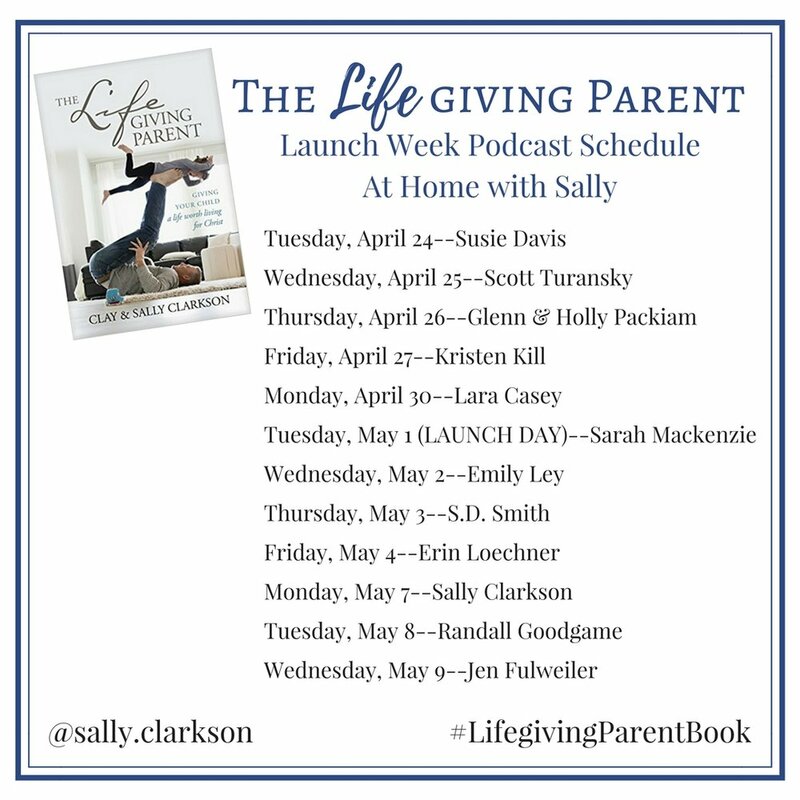 MORE LIFE: Don’t miss the mini podcast that Sally and Clay recorded for the Lifegiving Parent. Next month includes a talk on Robert McCloskey, a special video from Sally and Holly about illustrator Eloise Wilkin, a talk from Kristen about Van Gogh, the continuation of our Hebrews study and more special talks from Sally. We continue to be amazed by the ways that you are encouraging your children and seeking after the Lord for what He has for your families. We are blessed to be a small part of holding up your hands as you follow His lead. May He pour out peace and strength and faith to you this month.